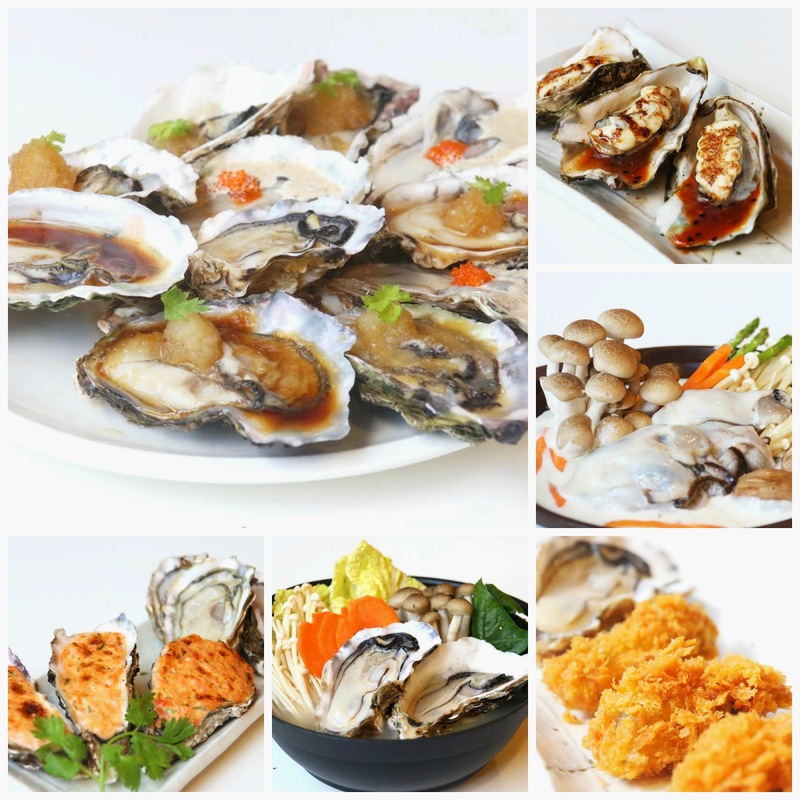 Christmas Special & Oyster Festival, Momiji Japanese Buffet @ Revenue House | JACQSOWHAT: Food. Travel. Lifestyle. The origin of the oysters comes from Osaki Kamijima located within Sentonaikai Nation Park in Japan. The 8 kinds of oysters at Momiji are: Goma Oyster, Ponzu Oyster, Japanese Apple Dressing Oyster, Panko Fried Oyster, Miso Teppan Oyster, Lobster Mayo Yaki Oyster, OysterShabu Shabu and Hot Plate Oyster. The oyster promotion is happening now till the end of 2014. As the joyous festive season is nearing, Momiji is also having a Christmas special where you can enjoy additional Christmas items such as Honey glazed turkey ham with mushroom sauce, Turkey breast teppan yaki, Turkey ham tempura with nacho cheese, Baked salmon lasagna and Christmas log cake. The Christmas special is only available from 19th December to 1st January 2015. Do note that the Christmas special buffet pricing is different from the usual. Promotions aside, bringing you through the buffet line at Momiji. Oysters being the highlight! Fresh seafood featuring unlimited servings of Snow Crab legs! A wide range of Shabu Shabu selections - the soup broth are all the same except the different meats. Moving on to the teppanyaki section where the chef uses an iron griddle to cook/grill food. Selections ranging from seafood, scallop, beef steak etc. I would suggest trying out Scallop with mentaiko dressing, it's the real deal. What's a Japanese buffet without sushi and sashimi right? I'm impressed by the wide range of raw dishes with many kinds such as tuna, salmon, swordfish etc. There's even temaki (hand roll), chuka hotate (seasoned scallop) and many sort of makimono! Moving on to side dishes such as fried salmon skin, gyoza, salmon/ chicken karaage, ebi tempura, yaki tori and many more. Overall decent, partly they were all cold by leaving them out for long. So try to catch them when the staff brings out a new set to refill, it's always the best when consume hot. The usual cooked food but I was surprise to find chill crab since there were already snow crab legs. Momiji offers cooked food such as cereal prawns, braised vegetables, scallop fried rice and fried soba. Apart from that, there were chawanmushi with 2 kinds - seafood and kani (crabstick). Some non Japanese dishes offered were dim sums and wild mushroom soup which explains the garlic bread. The real deal: FREE FLOW Sapporo beer is available at Momiji during specific timing. For dinner, it will be from 630pm - 730pm daily. And 1230pm - 130pm for brunch buffet. For the price I'm paying, I think it's really worth the value even though it's only 1 hour. My favourite part of the buffet, desserts timeeee. I've been to a few japanese buffet restaurant and it's quite rare to see chocolate fondue and waffles. Momiji is the first place I ever know which features DIY waffle. It was simple with the instructions stated clearly at the side. And 6 different kinds of Haagen Dazs ice cream to pick from. So tempted to try all 6 but we were so stuffed from the buffet spread. We had matcha, macadamia nut and strawberry cheesecake. The waffles were crisp but slightly dry within, otherwise all good! Thinking of a place to dine with your family during this festive season? Momiji at Revenue house is a perfect venue to hold events, corporate functions, gatherings with private rooms available to accommodate up to 150 pax. Seafood lovers, get going before the oyster festival ends.